As a student Diepenbrock was fascinated by the prose and ideas of the German philosopher Friedrich Nietzsche. Already in 1899 he considered setting Aphorism no. 423 from Morgenröthe (Daybreak) to music. (BD V:5) After a three-week visit to Italy, he started the composition in July 1905, completing it with never diminishing inspiration on 2 February 1906. In the first version of the work the passages in which the text is recited form merely a third of the total number of measures of the composition (157 of the 470). The orchestral introduction already comprises 74 measures. 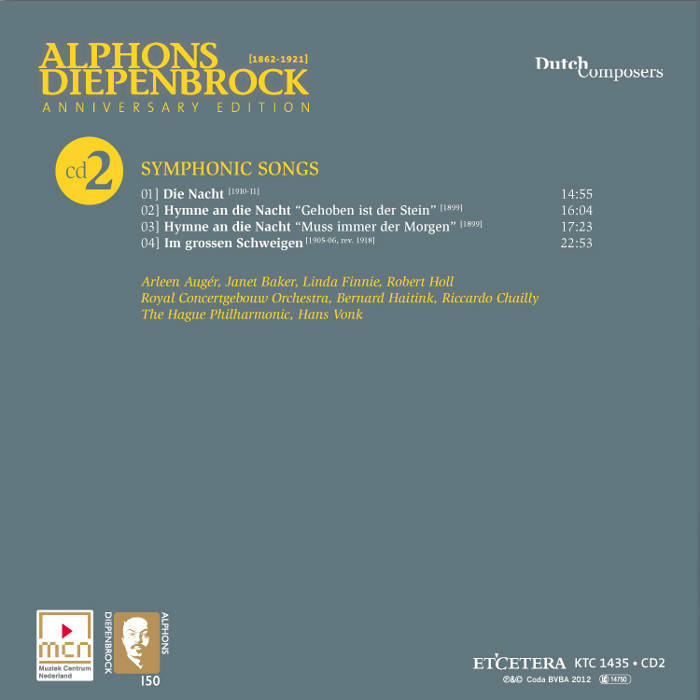 The episodes of varying lengths in which Diepenbrock presents the text are alternated with elaborate orchestral interludes. Remarkably, these proportions are not considered a problem in any of the early reviews of the composition. With the presentation of a few short melodic fragments in counterpoint, the orchestral introduction places us in the middle of the tumult of the port. The sea announces itself with a new motive suggesting broad waves: three descending seconds, of which the first and second note form a punctuated upbeat. Then the wanderer observes: “Hier ist das Meer, hier können wir die Stadt vergessen.” (Here is the sea, here we can forget the town.) In the following instrumental intermezzo of 45 measures the sea is presented to us in its austere beauty, but we also hear what the wanderer still perceives of the world he has just turned his back to: “Zwar lärmen eben jetzt noch ihre Glocken das Ave Maria […] aber nur noch einen Augenblick” (Indeed, the bells are still ringing the Ave Maria [...] but only for a moment more). To suggest the ringing of the bells, Diepenbrock uses the same three-note motive as in Vondels vaart naar Agrippine (Vondel’s Voyage to Agrippine, RC 64.) After the meaningful words “Jetzt schweigt Alles” (Now all is silent) this section of the composition concludes with a general pause. An orchestral intermezzo dominated by the ‘waves’ motive is followed by the line “Das Meer liegt bleich und glänzend da” (The sea lies there pale and brilliant) – the beginning of Nietzsche’s reflections on nature, which in comparison to human emotions shrouds itself in a ‘dazzling silence’, eliciting from the author the words “ja, ich bemitleide dich um deiner Bosheit willen!” (yes, I pity you for your malice!) The next orchestral intermezzo of 81 measures is divided into two sections and can be considered the instrumental development of the preceding material. First motives from the introduction are used, whereby the ‘waves’ motive frequently recurs, then the orchestra plays the melody to which the words “Das Meer liegt bleich und glänzend da” were sung. The wind instruments then introduce a new motive of seven relatively long notes, starting with a marked ascending fifth. The second phase of Nietzsche’s contemplations is introduced by the words “Ach, es wird noch stiller und noch einmal schwillt mir das Herz.” (Ah, it is growing even quieter and once again my heart swells.) This is followed by the painful realisation that it is the silent nature that confronts man with the fundamental imperfection of his own speaking; that man will only surpass himself if he is able to overcome these imperfections: “Muss ich nicht meines Mitleidens spotten? Meines Spottes spotten?” (Must I not mock my pity? Mock my mockery?) After the disclosure “O Meer! O Abend! Ihr seid schlimme Lehrmeister! Ihr lehrt den Menschen aufhören Mensch zu sein” (O sea, O evening! You are bad teachers! You teach man to cease to be man.) the seven-note motive sounds again softly in the high strings, however, now with five additional notes; thus it has become the first line of the Gregorian hymn Ave maris stella. But the wanderer pays no attention to this ‘transcendental language’. While he wonders: “Soll er sich euch hingeben? Soll er werden, wie ihr es jetzt seid, bleich, glänzend, stumm, ungeheuer, über sich selber ruhend? Über sich selber erhaben?” (Is he to surrender to you? Shall he become as you now are, pale, brilliant, mute, immense, reposing calmly upon himself? Exalted above himself? ), the enticing melody to “Das Meer liegt bleich und glänzend da” sounds. This is followed by another 41 measures by the orchestra: introduced by the opening melody to “Hier ist das Meer, hier können wir der Stadt vergessen”, the sea manifests itself for the last time with an enormous crescendo. Then the complete melody of the Ave maris stella is played in the highest registers of the orchestra, with which the composer, as a Christian, introduces his personal view on the deliverance from imperfection. The work concludes in the radiant key of E major. At the premiere by the baritone Gerard Zalsman and the Concertgebouw Orchestra conducted by Willem Mengelberg on 20 May 1906, the work was enthusiastically received and reviewed; in general it was considered a new pinnacle in Diepenbrock’s oeuvre. (For the programme notes by the composer, see BD V:651-652.) The premiere was unusual as Im grossen Schweigen was played both before and after the interval. A year later, on 30 May 1907, the work was performed again by the same musicians. In 1911 (between 1 May and 8 July) Diepenbrock thoroughly revised the composition. As the various orchestral intermezzos were cut back drastically, the work was reduced to 324 measures; the orchestration was also thinned out and a few melodic phrases that were very low for the voice, were rewritten as well. For this reason the voice’s opening passage, originally in E major, was also transposed up a whole tone. Although this alteration changed the original tonal concept of the work based on the key of E major, this adaptation created a direct link to the key of F-sharp in which the orchestral depiction of the sea had just been played. Thus, this connection was abbreviated by 13 measures. In the intermezzo following the first vocal phrase, 39 measures were replaced by 14. As a result, the ‘waves’ motive does not appear in this section. 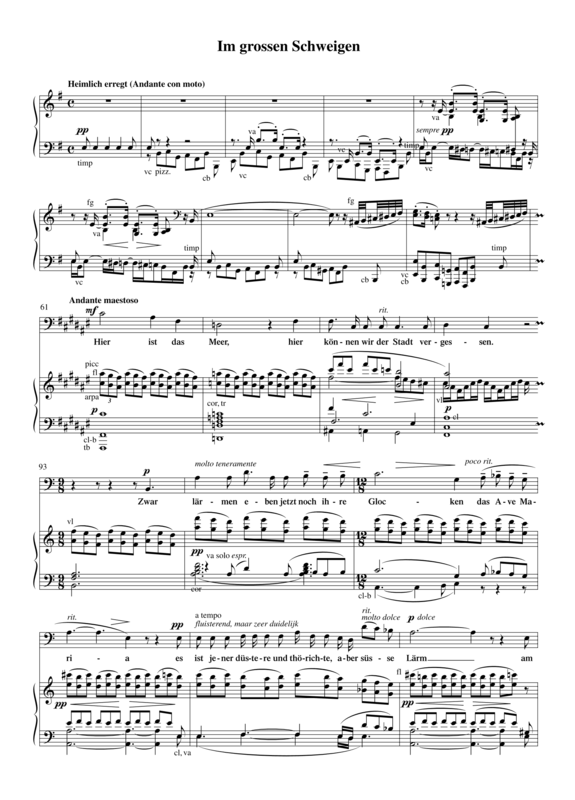 A similar cut of 42 measures followed after the line “ja, ich bemitleide dich um deiner Bosheit willen!”, whereby the entire first part of the instrumental development was deleted. After the final words “Über sich selber erhaben” the 41 measures in which nature manifests itself for the last time were discarded; now the final words are immediately followed by the complete melody of the Ave maris stella. Finally, Diepenbrock expanded the conclusion in E major by eight measures. In a letter to Johanna Jongkindt of 27 July 1910 we can already read that Diepenbrock considered the composition too long and too heavy and dark . (BD VI:353) When he went through the revised score with Gerard Zalsman in October 1911, the work even seemed very antipathetic to him. (BD VII:270) This was certainly prompted by the fact that through composing Marsyas (RC 101) and Die Nacht (The Night, RC 106) his orchestration had clearly changed under the influence of modern French music, which he himself considered a big improvement. However, the reason for shortening the orchestral intermezzos so drastically also had to do with the fact that Diepenbrock wanted to make the work more accessible and more practical for a future performance. Even after the revision the composer remained critical about the work. In November 1917 he requested the Concertgebouw Orchestra to cancel a performance of the second version with the excellent Wagner singer Richard van Helvoirt Pel that had already been scheduled: I am no longer satisfied with it. (BD IX:298) Although Diepenbrock revised the score once more in two stages in 1918 (19-28 January and 16-19 May), Im grossen Schweigen was not performed again for decades. It was not until 13 January 1952 that the baritone Laurens Bogtman and the conductor Eduard Flipse performed the work with the Rotterdam Philharmonic Orchestra, using a provisional edition of Diepenbrock’s final version published by the Alphons Diepenbrock Fund in 1947. A definitive edition appeared in 1974. However, the fact that the work was well received by a broad audience in 1906 and that both the Concertgebouw Orchestra in Amsterdam and the Kaim Orchestra in Munich (conducted by Jan Ingenhoven) played it without any technical problems, should be enough reason to perform the first version of 1906 again (with a few revisions in the orchestration made by the composer after the first performance). It would clarify the original concept of the work and enrich our comprehension of the composer during that period. aber nur noch einen Augenblick! Jetzt schweigt Alles! Das Meer liegt bleich und glänzend da, es kann nicht reden. mit roten, gelben, grünen Farben, er kann nicht reden. wo es am einsamsten ist, sie können alle nicht reden. ist schön und grausenhaft, das Herz schwillt dabei. Oh der Gleissnerei dieser stummen Schönheit! Wie gut könnte sie reden, und wie böse auch, wenn sie wollte! ist eine Tücke, um über dein Mitgefühl zu spotten! der Spott solcher Mächte zu sein. ja, ich bemitleide dich um deiner Bosheit willen! es genießt selber seine süße Bosheit des Schweigens. die Einbildung, den Wahngeist lachen? Oh Meer! Oh Abend! Ihr seid schlimme Lehrmeister! Ihr lehrt den Menschen aufhören, Mensch zu sein! bleich, glänzend, stumm, ungeheuer, über sich selber ruhend? Here is the sea, here we may forget the town. but one moment more! Now all is silent! There lies the ocean, pale and brilliant: it cannot speak. red, yellow and green: it cannot speak. is beautiful and awful, and makes the heart swell. Oh, the deceit of this dumb beauty! How well it could speak, and how evilly, too, if it wished! all this is but malice, mocking your sympathy! to be the plaything of such powers. yes, I pity you for the sake of your malice! it also enjoys the sweet malice of its silence. of error, illusion and insanity? Must I not laugh at my pity? Mock my own mockery? Oh sea! Oh evening! You are bad teachers! You teach man how to cease to be man! pale, brilliant, dumb, immense, reposing calmly upon himself? Het is de aanvang van den middeleeuwschen kerkhymnus Ave maris stella. Na verschillende stijgingen en dalingen eindigt dit tusschenspel met een groot decrescendo, en begint het 2e en laatste deel bij de woor­den “Ach es wird noch stiller” (D moll). — Na de woorden “Ihr lehrt den Mensch[en]” etc. treedt wederom de 1e zin van den genoemden hymnus op in het allerhoogste register, totdat de zangstem over de harmoniën van F moll en Es dur naar E dur terugkeert bij den slotzin “Ueber sich selber erhaben”. — In het naspel domineert de hoofdtoon­aard (E dur); verschillende motieven krijgen daarin hun uiterste span­ning, tot eindelijk na een groot crescendo de genoemde Hymnus in zijn geheel doorweven met verschillende contrapuntische motieven als triomfzang optreedt, en een korte coda het werk afsluit. Bij den aanvang der Diepenbrock-week, die op uitvoeriger beschouwing dan waartoe nu gelegenheid is aanspraak heeft, past een beknopte mededeeling over de gebeurtenis van gisteren in het Concertgebouw. — Diepenbrock's nieuwste compositie, een tonen-gedicht, op de reeds meegedeelde proza-bladzijde van Fr. Nietzsche gebaseerd, heeft ontzaglijken indruk gemaakt. Door een stemmingsvolle, slechts 'n oogenblik door te helderen koperklank uit het wazig mystieke gerukte uitvoering van Wagner's Parsifal-voorspel waardig ingeleid, is Im grossen Schweigen tweemaal – een pauze gaf de noodzakelijke rust – door het orkest en Gerard Zalsman, met Mengelberg als leider, voorgedragen ten aanhoore van een volle zaal en, later, van een zeer talrijk belangstellend auditorium. Ik heb al vernomen van verlangen naar de derde uitvoering: het is te verklaren! Immers deze Nietzsche-muziek, logisch en helder van bouw, rijk aan melodisch karakter, heeft een stuwende innerlijkheid zoo omvattend en zoo diep, dat niet velen spoedig haar overzien en peilen kunnen. Bezwaarlijk te vinden is de Nederlandsche componist, die het orkest in zoo wonder-elastische golving polyphoon doet zingen als Diepenbrock, en op geen enkelen anderen kunnen we ons beroepen, die het innerlijk uitdrukkingsvermogen zoo sterk en zoo veelzijdig bezit als hij. Zijn Im grossen Schweigen heeft meer dan schilderend-vizionaire en stemming-suggereerende kracht – we ontwaren in zijn muziek de breede, overtuigende ideeën en de zielswerking die verheft. Als bij elke echte groote kunst ondervinden wij haren louterenden invloed te machtiger naar mate wij er, scherpend de fijnste muzikale intuïties, langduriger ons indenken en in-voelen. — Hoe dankbaar diene men Mengelberg en het orkest, en den zanger Zalsman, te zijn: dat zij de uitvoering van Diepenbrock's tonen-dicht op zoo indrukwekkende wijze mogelijk maakten! En hem zelf... heeft men met de gewone uiterlijke teekenen van waardeering gehuldigd, niet wetend hoe anders te doen of te spreken. Eer voegt wel bij Diepenbrock's idealisme het ontroerde zwijgen.